Bringing an epic approach to real time strategy war gaming, players develop their own story with an open world sandbox mechanic in a desperate attempt to win the World War 2. The game sees you to take part in a nerve wracking game of cat and mouse as you scour the seas in search of enemy fleets and send submarines to strangle their supply lines. 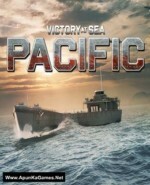 In Victory at Sea Pacific you can covertly recon enemy positions and launch a large scale amphibious assault by sea and air against the chosen targets. Fighting a coastal invasion brings together large numbers of ships from landing craft of various types, to multiple flights of aircraft and mighty ships to bombard the enemy positions in an attempt to capture key objectives from the enemy In addition Victory at Sea Pacific allows you to take command of large squadrons of planes against enemy fleets and send scouts to hunt for the enemy wherever they may be.